Posted on October 28, 2012, in Blue Monday, California, Carpe Diem, haiku, Long Beach, Southern California, Straight Out of the Camera Sunday. Bookmark the permalink. 27 Comments. Great imagery on flying … lovely picture. Thank you for sharing on Carpe Diem. What beautiful blue water and a great capture of the birds in the air. Love the pelicans waiting for the their share of the fish flesh. Nice poem, too. Sea birds are fun thing to watch Great shot. Happy Blue Monday! Very nice! I always find the harbor so refreshing and uplifting! Looks so pretty and relaxing there! They are all gathering for the family bird meal. superb view! Are you lucky enough to live near this scene? fish-flesh would make for a good tongue twister! The perfect words for this photo. Great shot! that is their raison-d’etre! I love to watch them waiting for handouts…. Or they will settle for a chicken sandwich if available! Nice to see that you see blue water once in a while. The desert is stark and beautiful but water can be so nourishing. I love blue water and pelicans. Lovely shots. I specially love blue and white china..or whatever! Thanks for your visit. Oh what a pretty blue. I love the water. Thanks for sharing. And thanks for stopping in to visit my blue post today too. Yes, seagulls are always waiting for fishing ships to enjoy a banquet. Nice image and excellent haiku; it sounds beautifully. look at the beautiful sea. So peaceful and lovely. Beautiful capture! Always a pleasure to visit the blue-ti-ful crew from SMiling Sally’s! Have a wonderful week! Come visit me soon. If you like giveaways I ahve a double one going on! Great shot and beautiful haiku. 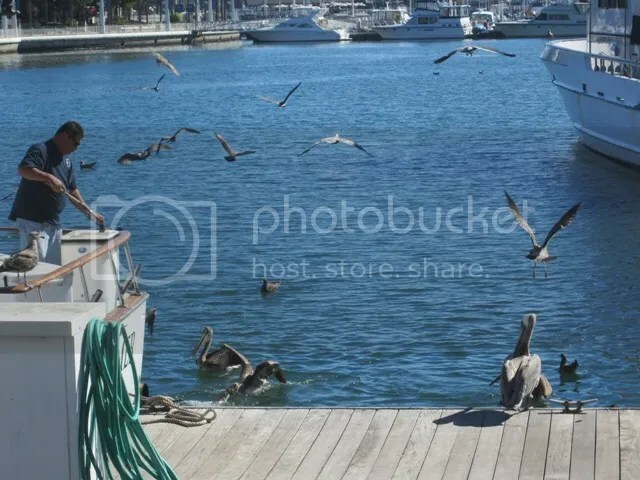 Very nice haiku – I love to watch the seagulls and pelicans at the docks looking for something to eat.